Dan Patterson and I went down to Zuccotti Park again to see what a beautiful Friday afternoon looks like among the sea of protesters. I had yet been there on a Friday and the energy was at a much higher level today. With the weather cooperating, school being out and the beginning of a three-day weekend for many, the park was buzzing. As we walked around the outskirts of the encampment, we had an idea: let’s talk to one of the food carts that seem to be a permanent fixture. When I went the first time, I noticed “There’s somewhat of a Shakedown Street with Halal carts, fresh fruit stands, smoothie hut and a bread stand. Oh, and a typical New York souvenir stand.” Here’s the story of one of the vendors. Abdul Mubarek has been operating his Halal stand in Zuccotti Park for the past six years and while he supports the Occupy Wall Street protests, his business has been suffering losses. As the protesters have gathered in the park for the past three weeks, one would think his truck would appeal to the hungry crowd. Instead, he says, they are eating the food that has been donated to the cause. He says they’re getting everything from water to pizzas from donations. 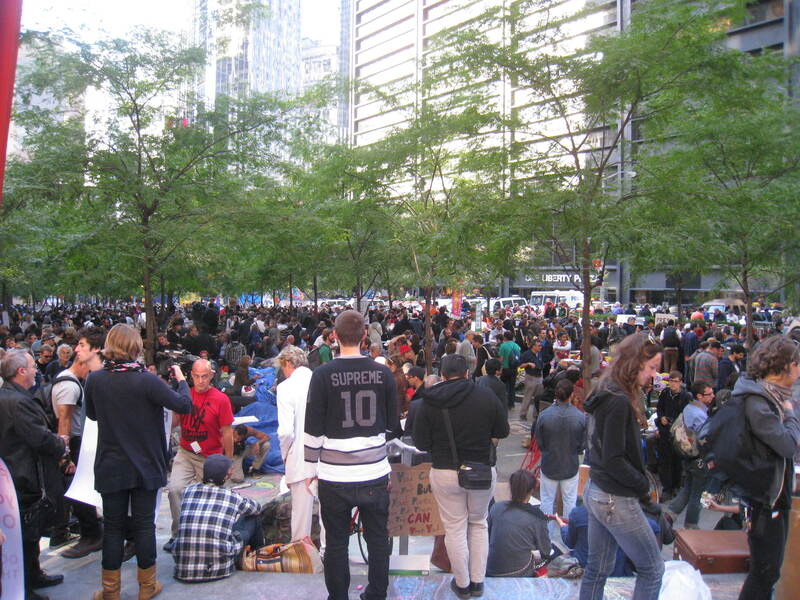 Mubarek said that before September 17th, when the protesters first showed up at Zuccotti Park, business was good. But now, because of the growing movement – which has led to a decrease of tourists – business has turned south. Nonetheless, he still roots for the protesters. When asked if he sees any parallels between these protests and of those from Egypt, his home country, he said yes. Mubarek commutes every day from across the river in Jersey City, and while he can move his cart, he chooses to stay. Click here to listen to the interview Dan and I conducted. Click here for a Flickr set of images from today.